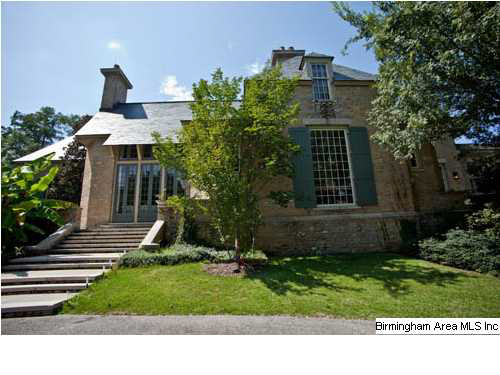 Not so often do you find a Bobby-McAlpine-designed home for sale. 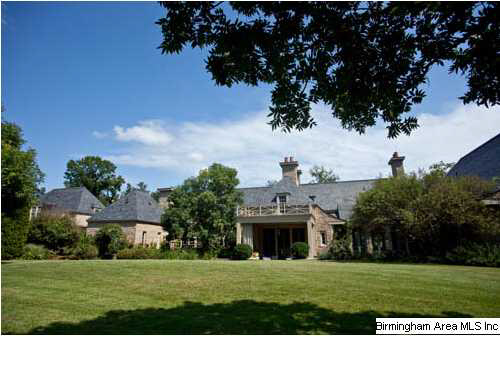 This one in Mountain Brook, Alabama, however, is. 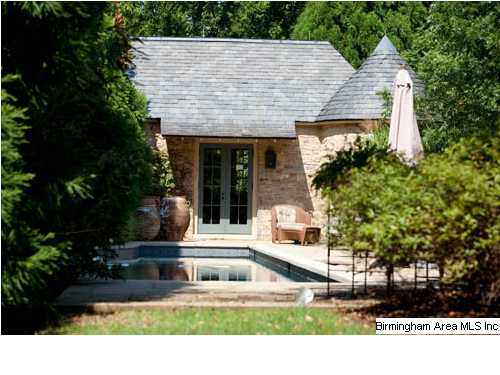 It is gracefully tucked into a very private wooded lane which you would hardly know is there. And it is gorgeous. 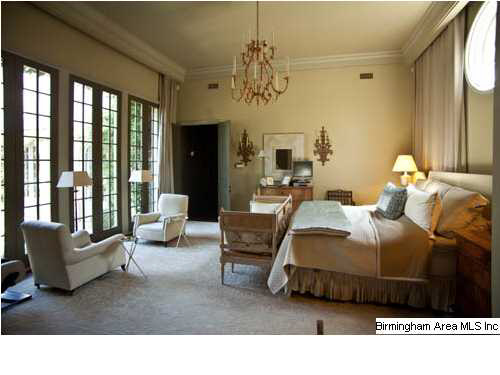 The expansive master bedroom, bathed in light from a bank of full-length mahogany windows. A room-long custom rod supports untold yards of drapery. A pair of French fleur-de-lys sconces flank an antique chest. Comfy lounge chairs, each with a floor lamp and a martini table, face one another. A cushioned antique French settee rests at the foot of the bed. As a color expert, I truly enjoy trying to guess paint color from my Ben Moore fan deck: here I am guessing French White (Benjamin Moore 1093). 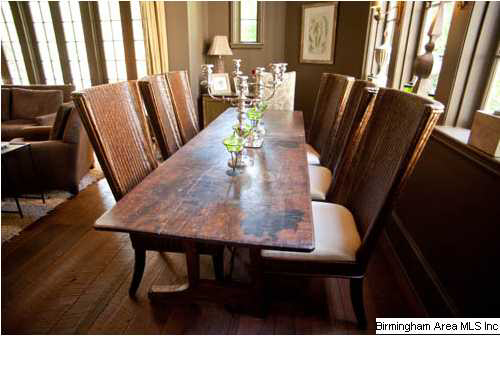 Two hundred year-old rough cut wood planks from a Virginia mill provide flooring throughout much of the ground level. Paint guess for above: Historic Collection Jamesboro Gold HC-88. A custom rack with a gourmet’s collection of All-Clad copper pots soldiers across the kitchen window. An second Subzero, identical to the one pictured, is just out of the photograph and set at an angle on the lower right side. Dual islands allow freedom of movement in the core cooking area both for the family or for entertaining. Moving through the kitchen, a light-filled breakfast room features an easy exit into the porte-cochère for convenient access. 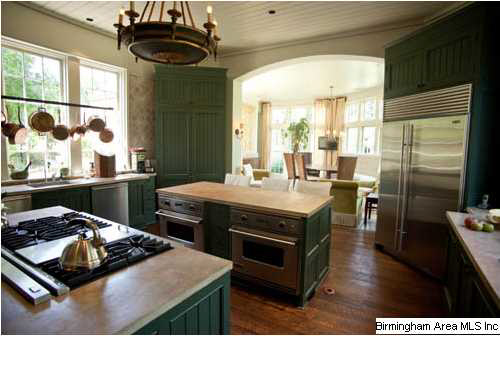 Paint guess (kitchen cabinetry): Historic Collection Yorktowne Green HC-133. Breakfast room/morning room: This area of the house is floored with gorgeous Peacock Pavers, a Bobby McAlpine favorite. Made right here in Alabama by the inmates at Atmore prison! 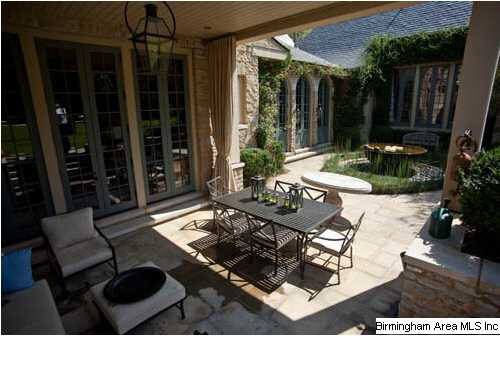 When you see Peacock Pavers for the first time, you might mistake them for the finest European limestone. They are actually made of concrete, and are incredibly durable as well as being stunningly beautiful. 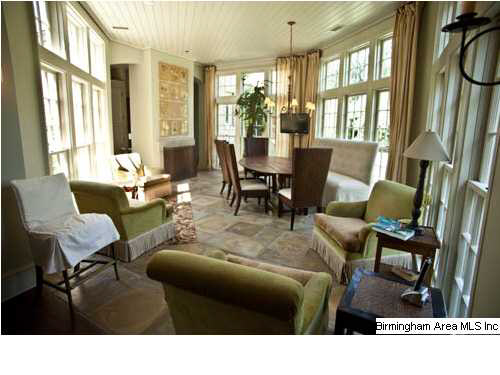 Casual comfortable seating invites relaxing over a cup of tea or the morning newspaper. A free-standing settee provides casual seating on one side of the table. Notice how nicely the back of the settee relates to the back of the chairs’ height. Tongue in groove woodwork on the ceiling is a glossy counterpoint to the matte paver flooring. An angled fireplace allows cozy dining on cool nights. The living room with its deeply coffered ceiling. Focal point is a museum-quality tapestry from France above the fireplace. The soft, muted colors convey an atmosphere of quality, comfort and elegance. The draperies on the right side of the photograph serve as portières when desired. Paint guess: ceiling, Historic Collection Tyler Taupe HC-43. Body, a really rough guess: French White same as in the Master Bedroom. 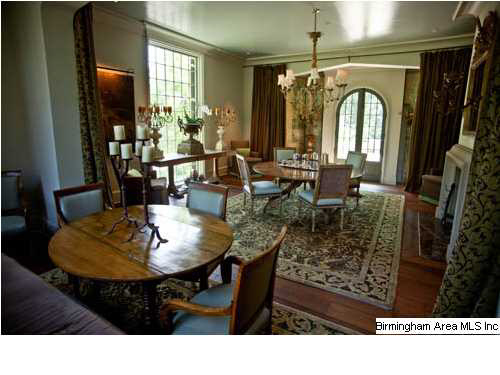 Entry and Dining Room: The arched main front door is visible, whereby guests may enter directly into the dining area. There is also also a hallway with another portière on the right side of photograph, which leads into the body of the house. Notice the exquisite lacquered finish on the ceiling. This is just one example of amazing workmanship throughout. Paint guess: same shade on walls and ceiling, with high gloss on ceiling and eggshell on the walls, Historic Collection Woodlawn Blue HC-147. Although large, the home nestles beautifully into the property and soft landscaping. It has a stateliness and a quiet elegance as you see it unfold across the length of the rear lawn. An old copper sugarcane kettle (to the right) has been fashioned into a water-feature. The triple bank of doors on the left lead into one of the family rooms (partially photographed and shown above as “informal dining”). The windows on the right are in the master bedroom. The shutters appear to be close to Benjamin Moore Historic Color Yorktowne Green, HC -133, though the door trim is apparently somewhat more muted, possibly Van Courtland Blue.The beautifully crafted, but understated, front does not give evidence of the expanse of the residence as viewed from the back. As a point of interest, 85 truck loads of concrete were brought in for constructing the 36″ wide foundation walls. This was built to last. 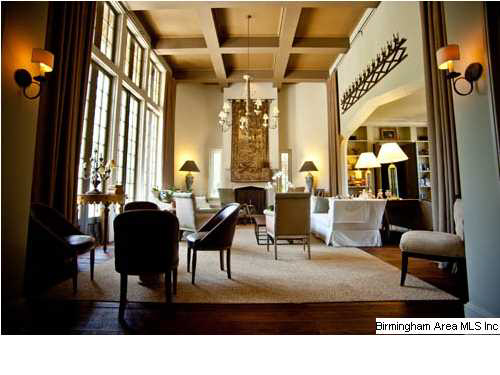 For more information the Listing agent is Jeffrey Klinner, LAH Real Estate, Mountain Brook Office, Birmingham, AL. 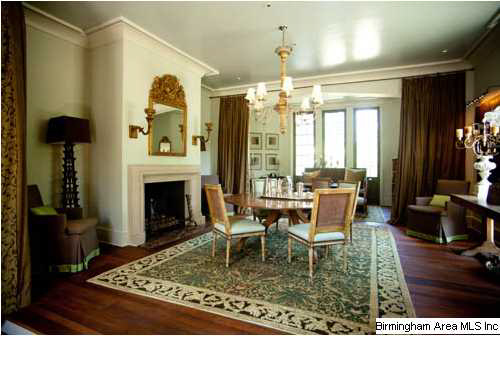 All photos from Birmingham Area MLS Inc. This entry was posted on March 2, 2012 by Ellen at Color Calling. It was filed under Entry, homes for sale, portière, Residential styling and was tagged with Bobby McAlpine.